I hate slavery. I'm not sure why it really gets under my skin. There are plenty of things to hate in this world as terrible acts of oppression, but I have a particular problem with slavery. No one really defends it anymore, atleast not in the open. They call it different things, or we pretend that types of labor one or two steps removed from slavery are not really that bad, or too important for the economy to stop. Prior to reading American Taxation, American Slavery I had read a few books on slavery in the American experience, but they were almost all personal accounts of African Americans. Books like Up from Slavery by Booker T. Washington, My Eyes Were Watching God by Zora Neal Hurston, or Uncle Tom's Cabin by Harriet Beecher Stowe. These are great books that introduced me to a lived experience that was usually both quite personal and incredibly revealing. Classics in their own right, but distant and unrelatable in time and place for a 20th century kid like me. 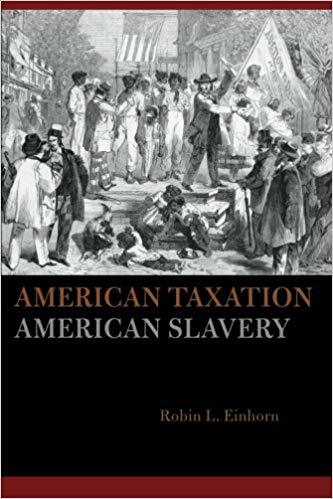 I'm a social science nerd with an inclination to economics so American Taxation, American Slavery by Robin L. Einhorn is much more up my alley. Einhorn is a tax historian and the book follows a chronological account of taxation in the American colonies roughly from the first settlers up to the signing of the US Constitution. The introduction gives a brief history of taxation practices in Europe prior to the founding of the American colonies and is invaluable. It helped me understand that taxation policy can only work as well as contemporary technology and bookkeeping allow. People trying to get out of paying taxes is as old as governments collecting taxes. It's a technological arms race. The Appendix entitled How to Talk About Taxes is also extremely useful, and should be read before reading the rest of the book. Einhnorn is an economic historian with a focus on tax history, and while that may sound incredibly boring it really is not. Taxation is where the political and policy tires meet the road and our contemporary discourse on politics power suffers terribly from not talking enough about taxation and its impacts. One gets the impression that Einhorn only set out to write a book about taxation in the colonies, but ended up writing a book about taxation and slavery simply because of the oversized place that slavery played in the economies of the colonies. Much of the very early tax history of the American colonies is unknown because there weren't that many records. A recurring theme throughout the book is that if rich people do not wish to pay taxes they will endeavor to keep the state weak. A fact that was as true then as it is now. The differences between each of the colonies in terms of how strong their respective institutions are is telling. And Einhorn spends considerable time in discussing how northern, more urban states, had stronger social and governmental institutions. While southern slave states consistently suffered under the yoke of wealthy plantation owners who did not want their state governments to function well. Southern slave holding states had weak institutions intentionally kept that way by wealthy plantation owners, and there was a constant tussle between town based artisans and the landed gentry in the countryside concerning taxation. One of the statistics Einhorn cites are the records showing how many tax collectors were murdered in Virginia each year, and years where the government in Richmond would simply fail to collect anything. Two statistics clearly linked to one another. Slaves were never taxed in the colonies. Neither at point of sale or as chattel. One of the tricks that Jefferson and Madison played at the Constitutional convention was to argue that enslaved peoples were both property and not property. Declaring them a "certain species of property", and that regardless of what slaves actually were, could definitely not be taxed. I learned in school that American slavery was a form of chattel slavery, where chattel is a form of property that can move, unlike real estate which is land. 1 However, legally speaking, enslaved Americans were never chattel, because had southern plantation owners admitted that their slaves were property of any sort, they might have been forced to pay taxes on them. Something they collectively spent fighting for until the American Civil War negated the issue. This is the tricky game southerners played at the Constitutional convention that resulted in the Three-Fifths Compromise and our still existent Electoral College system. Jefferson, Madison and other southerners waffled back and forth on the question of what exactly slavery was. All the while ensuring that it would be recognized as legal and necessary, but never so propertied so that it could be taxed. The Three-Fifths Compromise was eradicated with the 13th Amendment. However, its buddy The Electoral College System remains to this day and continues to inflict its undemocratic shadow on the American people. Without something like the Electoral College the United States could not have implemented the Three-Fifths Compromise. The Three-Fifths Compromise requires that votes from slave states be worth more than votes from non-slave states. That's basically the undemocratic point of the thing. And the only way to implement this uneven weighting of votes is to have something like the Electoral College. Think about that during the next US election cycle when the entire world wonders about America's weird electoral system. It's a leftover from the Three-Fifths Compromise and slave owning founders that the United States has been unable to shed. And a genesis of the Electoral College that the mainstream American media pundit class obediently ignores. One can see the echoes of modern electoral politics in Einhorn's descriptions of the Constitutional Convention. She doesn't shy away from these echoes, and if anything I think does a good job of teasing them out without overemphasizing them. I don't believe she explicitly calls out anything in modern American political discourse as being directly traceable back to an 18th century discourse, that exercise is left to the reader. And if the reader is interested they should investigate contemporary libertarian ideology; its belief in the supremacy of property rights, the destruction of state institutions, a hatred of taxation, and its use by industrialists like the Koch brothers to prosletyze Right to Work legislation. The interests of antebellum slave owners remain remarkably aligned with contemporary libertarian thought. My biggest takeaway from Einhorn's book is that trying to escape the legacy of slavery in America is an effort of national hagiography. Slavery shouldn't be seen as something that America once engaged in, or even as something that America must simply amend for. But as something deeply embedded in the cultural consciousness of American political and taxation discourse. Slavery is still with us and should not be treated as some sideshow of American history. Slavery is still legal in the United States and we still have slave markets and products you can buy produced by slaves. Contrary to what many Americans believe the 13th Amendment to the US Constitution did not abolish slavery in the United States. Slavery is permitted in the United States if a person is imprisoned. Bill and Hillary Clinton even had house slaves when living in the Arkansas Governor's Mansion. I once spent a month in Doha, Qatar doing computer work for a company building an office sky scraper. Every day as I and my Italian colleague would walk to the site to begin our day, we joined busloads of south Asian men working as construction workers on the same site. No one wore hard hats even though there was a sign saying they were required, and no bathrooms were provided so the primarily Nepalese and Tamil workforce pissed in specified corners of the sky scraper. My colleage and I were white so we were able to use the BMW dealership across the street. In short, it was fucked up. And I bet many of those construction workers had their passports taken from them and lived in squalid run down camps. I'm not quite sure which bothers me more, the fact that this kind of treatment persists in wealthy countries, or that we're OK with it? Should we consider these construction workers slaves or does that denigrate forms of slavery that are even more barbaric? Does it even matter, they were treated like sub-humans. I grew up in the American south and I remember my brother coming home from school one day and mentioning that his class had learned about the War of Northern Aggression. That set my parents into a barely contained rage and resulted in a difficult discussion between them and my brother's middle school teacher. This was my first lesson in the lengths Americans will go to protect their mythological narratives surrounding the history of slavery. I've tried, but I've never been able to sit through an entire showing of Gone with the Wind and frankly, I don't give a damn. The sheer amount of apologia for slavery I experienced growing up and the many efforts to claim that the Civil War was not about slavery left a permanent mark on my consciousness. One recurring apologetic for the Civil War is that it wasn't about slavery, but was instead about economics. I think Einhorn would somewhat agree with that idea, and then proceed to point out that in the antebellum south the two were indistinguishable.